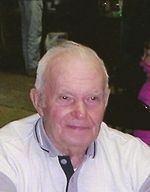 Homer E. Longden age 80, of Ashland, died Friday June 26, 2009 at the Hospice House. He was born in Woodsfield, Ohio on August 31, 1928, the son of Clyde and Grace (Covey) Longden. He lived most all of his life in Ashland. Mr. Longden was a lifelong farmer and had also worked at National Latex as a Cyclone operator for 43 years before retiring. He was a veteran of the U.S. Army where he served in the Korean Conflict, he was also a member of the Eagles and the V.F.W.. Mr. Longden was an avid card player and enjoyed feeding his fish. On June 27, 1980 he married Elizabeth (Householder) Longden who survives. Also surviving are his two daughters; Kathy Longden of Ashland, Nancy Longden of Ashland, two sons and daughters in law; Richard and Tina Longden of Ashland, Larry and Terri Kane of Jeromesville, seven grandchildren, and five great grandchildren. Other survivors include his two brothers, Clyde Longden Jr. of Ashland, Dale and Lisa Longden of Tacoma, WA., along with his two sisters Doris and Kenneth Carpenter of Bailey Lakes, and Janet and Clarence Jackson of Greenwich. He was preceded in death by his parents, a brother and six sisters. Graveside services will be held at 11:00 A.M. on Tuesday June 30, 2009 at Ashland County Memorial Park with Pastor Ted Risner officiating. The family suggests memorial contributions may be made to Hospice of North Central Ohio, 1050 Dauch Drive, Ashland Ohio 44805.